Redona Williams, Townsend Elementary School principal, Jayrone Elliott, Green Bay Packers linebacker, Dustin Hinton, CEO and president, UnitedHealthcare of Wisconsin, and Dr. Reginald Lawrence II, regional superintendent Milwaukee Public Schools, announced UnitedHealthcare’s $11,000 donation to Elliott’s Dreambuilders program at Townsend Street School in Milwaukee. The donation will be used to fund Blessings in a Backpack, a national nonprofit that provides students with bags of nutritious food each weekend. Green Bay Packers linebacker Jayrone Elliott and UnitedHealthcare teamed up today for a volunteer service project at Milwaukee Public Schools’ Townsend Street School in the Sherman Park neighborhood. Elliott, the 2016 Green Bay Packers Walter Payton Man of the Year, joined the UnitedHealthcare employees at the school for the volunteer activity and to announce support of the Blessings in a Backpack program for another academic year. UnitedHealthcare donated $11,000 to Elliott’s Dreambuilders program to fund Blessings in a Backpack, a national nonprofit that provides students with bags of nutritious food. Beginning with the new school year in August, more than 100 students will leave Townsend every Friday with healthy food and snacks for the weekend. During today’s event, Elliott and UnitedHealthcare donated backpacks of healthy food to all of Townsend’s 320 students. 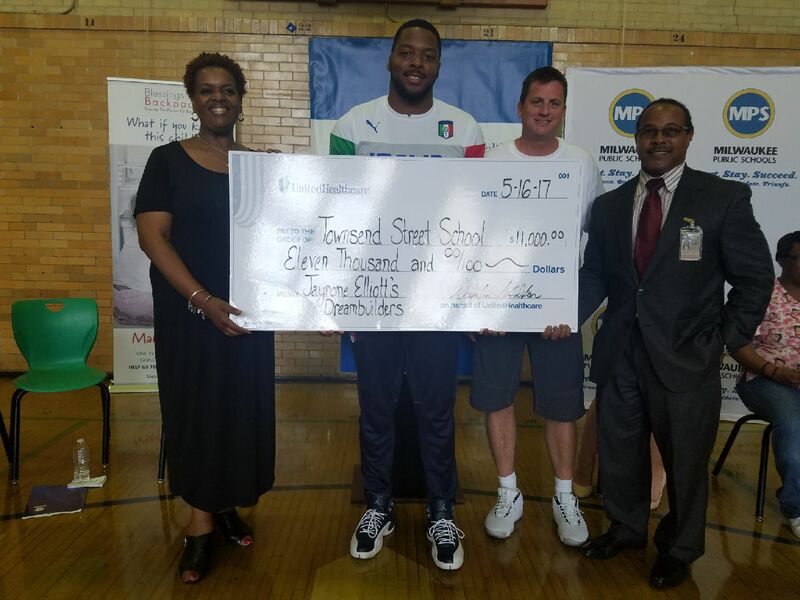 “UnitedHealthcare is grateful for the opportunity to support Townsend Street School and partner with Jayrone Elliott’s Dreambuilders to promote healthy lifestyles and good eating habits,” said Dustin Hinton, president and CEO, UnitedHealthcare of Wisconsin. Last year, in addition to supporting Blessings in a Backpack, UnitedHealthcare granted funds to Townsend to renovate a student activity center. 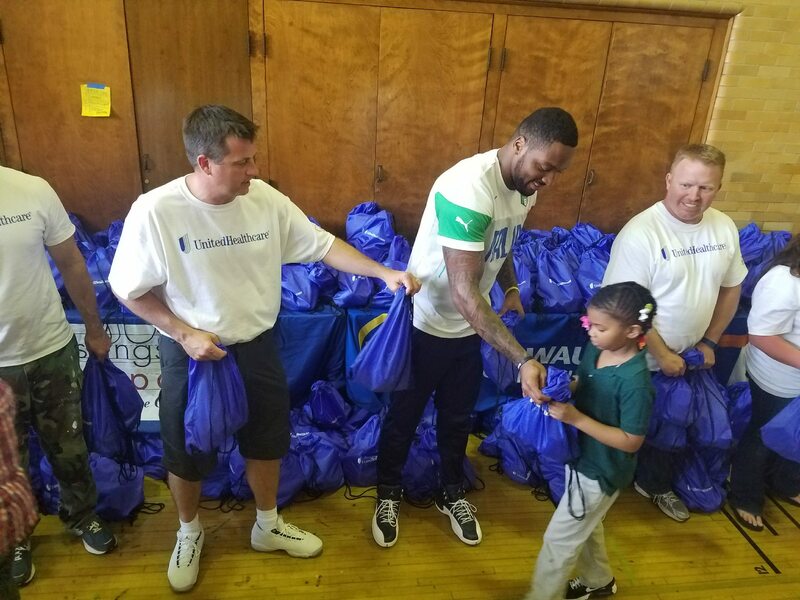 Students from Milwaukee’s Townsend Street School received backpacks filled with food on Tuesday from Green Packers linebacker Jayrone Elliott and Dustin Hinton (left), CEO and president, UnitedHealthcare of Wisconsin. UnitedHealthcare provided an $11,000 donation to Elliott’s Dreambuilders program. The donation will be used to fund Blessings in a Backpack, a national nonprofit that provides students with bags of nutritious food each weekend.